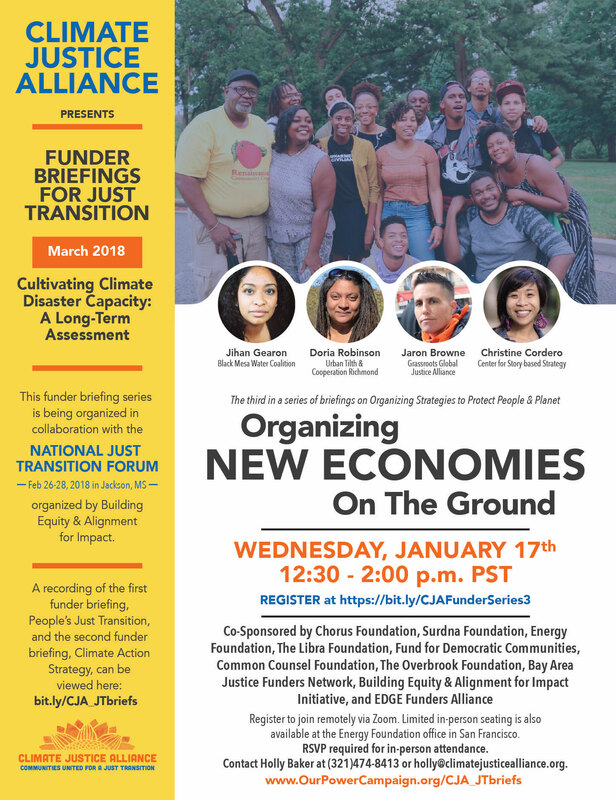 Longstanding and emerging frontline leadership, alliances (representing hundreds of under-resourced grassroots communities), and movement support organizations have formed a growing climate justice movement ecosystem that is shutting down the “dig, burn, dump” fossil fuel economy responsible for accelerating the climate crisis. Simultaneously, they are building local living economies that integrate community solutions and catalyze a Just Transition with equity at its core. Our funder and donor partners are responding to the urgency of this moment. They are advancing Just Transition through their partnership with and investment in frontline communities and their climate solutions. Imagine what we could accomplish with equitable resourcing to scale out local power that shifts cultures of practice to mitigate climate change now. Our members have shut down incinerators, prevented the expansion of fossil fuel infrastructure, built model renewable energy job training programs, and passed local Just Transitions plans and policies—YET, the Grassroots Organizing Sector (GRO) receives only 3 to 5% of overall environmental funding. Grassroots organizations have been building relationships and power at the local level for generations and are best suited to hold industries, institutions, and elected officials accountable to advance climate justice. Our goal is to help move at least $40 million by 2020 in climate funding not previously committed to the GRO Sector to support their success. Resources alone won’t create the shift needed. We are working with our Funders Circle, allies, individual donors, affinity groups, and initiatives to build a new vision of and approach to Just Transition within philanthropy by: centering trust and relationships for equity in our organizations, institutions, and sectors; deepening understanding of our complex relationships to accumulated wealth tied to historical injustices; challenging extractive practices; and advocating for the GRO Sector’s increased access to land, resources, and capital. We invite you to explore with us philanthropy’s role in and responsibility to frontline communities and to Just Transition. To learn more about how to shift your individual giving, contact Marion Gee at marion@climatejusticealliance.org. 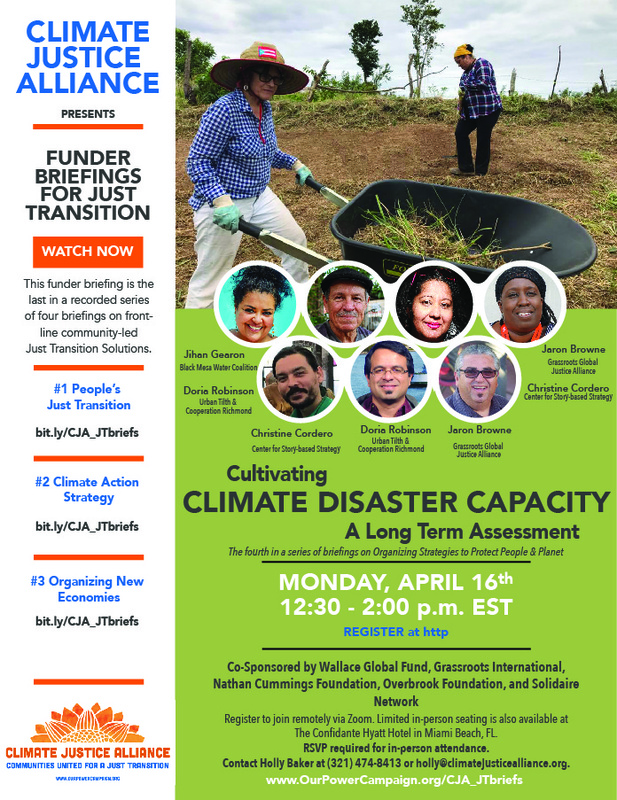 Funder Partnership with Climate Justice Alliance Will Advance Our Four-Year Strategy to: 1) Grow a powerful grassroots climate justice movement that links social, environmental, and economic justice communities; 2) “Build the Bigger We” – a broad, inclusive social movement that collaborates across sectors; and 3) Cultivate and implement replicable Just Transition solutions that move us toward sustainable, intersectional, and regenerative economies. Work as thought partners with CJA as well as aligned philanthropic and grassroots influencers and funders. Help identify other national foundations or organizations that can and want to move resources and capital to the grassroots sector. Provide funding directly to the grassroots sector. 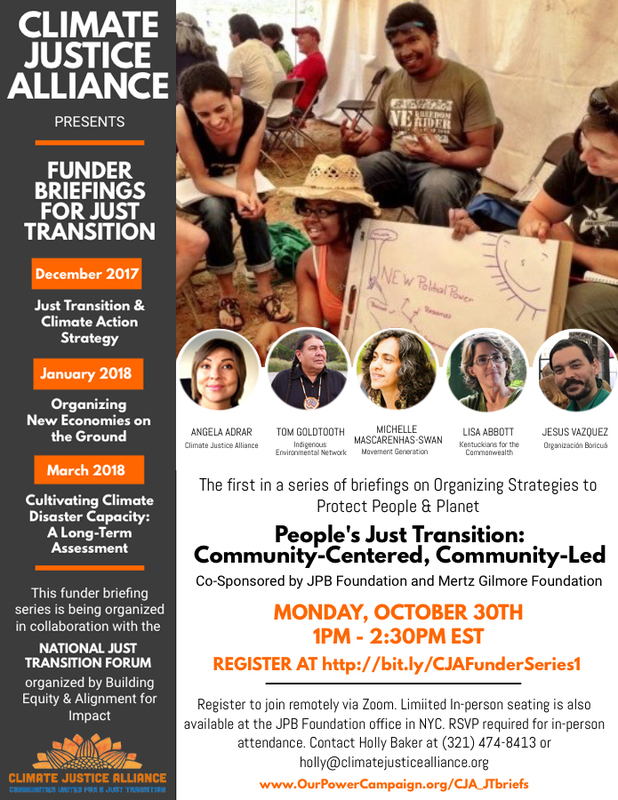 Develop and implement a coordinated strategy with CJA to hold funder briefings, engage in funder tables, events, affinity groups, and multi-sector efforts to promote more grassroots funding. Develop a mapping and power analysis of the current climate funding landscape. Reinforce and publicize the narrative of frontline communities, the Grassroots Organizing Sector, our climate justice framework, and Just Transition among philanthropy, the environmental movement, and labor. Draft position papers, articles, and op-eds in philanthropic journals to support the shift. Philanthropy & Just Transition – Learn More! 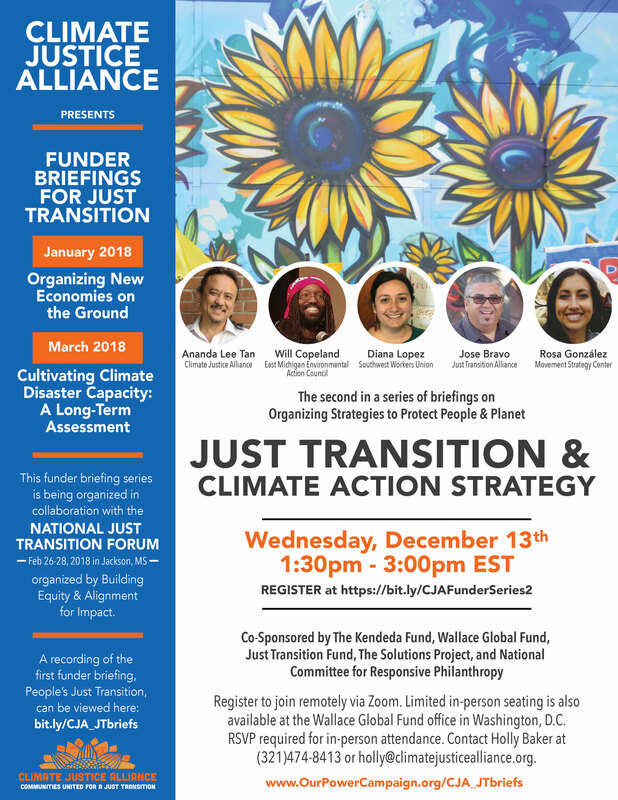 From 2017 to 2018, Climate Justice Alliance and aligned funders hosted the Funder Briefings for Just Transition Series, a four-part program designed to show how philanthropy can engage with and support Just Transition principles, strategies, and practices of frontline communities that are driving systemic solutions for the planet.